Circuit design By G. Seleri IW2DWN. On-field preliminary testing By G. Seleri IW2DWN and C. Parmigiani IW2FER. Data Analysis By G. Seleri IW2DWN and C. Parmigiani IW2FER. Addendum: XSP Power Pack By G. Seleri IW2DWN. IMD Graph with two tones, first tone 19 kHz, second one 20 kHz, same amplitude. Intermodulation distortion present at 1 kHz is 42 dBc under the main tones level. Spurious Intermodulation products beside the mail tones point out an even better IMD, about -44 dBc. IMD Graph with two tones, first tone 2 kHz, second one at 3 kHz, same amplitude. I have also noticed a lack of circuit schemes, most of them are a carbon copy of each other. requirements because of their input impedance, capacitance, slew rate and so on. "XSP - X Signal Prædactor" (Yeah, it's "spaghetti" english/latin, logo design is in progress). Some resistor values have been changed to match output impedance. Circuit has been boxed into an old TXCO case and it is very compact and robust. Insulated pass-thru pins are ideal for our purposes and shielding is very good. Shielding is good of course only for RF fields, there is no easy way to cut-off strong ELF/VLF fields, i.e. 50 Hz. The interference can be reduced setting up (phisically) little circuit or by using SMD components. All the changes in the schematic has been done with the agreement of the author, who is also constantly in contact with us. We choose these locations due to the fact that active 50 Hz filter is not ready yet (!) and there is not a massive urbanization. Track01: XSP receiver powered with single 12V source, Sony DAT recorder TCD-7, Bikeloop Antenna, ground. Track02,03,04: XSP receiver powered with single 12V source, Sony DAT recorder TCD-7, ground, antenna was made by two huge insulated cables, each 2 mt. long, suspended to trees and insulated from them. Both cables formed a "V" shape, with XSP located at the bottom. The XSP has (actually) no gain, it's just a front-end. Post-amplification of signals has been made by DAT manual recording level control. This operation provides enough signal for a good recording. We pointed out immediately a strong "Electrometer" effect, strongly reduced after a good grounding. We are not going to explain this common electrostatic phenomena, but the receiver is able to receiver people walking around the receiver, brushing hair and so on. A curious phenomena was the reception of the wing-beat of flies and insects flying close to the aerial. After a brief investigation (Many thanks to Renato Romero, Scott Fusare and Michele D'Amico) we found out that insects are apparently carrying often a small electrostatic charge. The exact charging mechanism is not clear but it should be partially due to collisions with dust particles while in flight, or air friction of the wings. OK that's 4*Pi* epsilon naught*radius(meters) , as a guess the bee would be .5 cm in radius so that's 55 femtofarads. 50 pC / 55fF = 898 volts! That's just a very rough guess of course. How much of that is on the wings I don't know, but certainly enough that the beating of the wings can couple a signal into the antenna. The moving wing will form one "plate" of a capacitor, the antenna the other. As the wing moves the capacitance changes (slightly) and modulates the voltage being induced through the antenna by the current fluctuations. I = C*dV/dt + dC/dtV the second term in the derivative (which is usually forgotten) is at work here. By the way, I have been unable to find any confirmation of my predicted voltage in the literature". Signals above were recorded in different places and in different days, this means that is a common phenomena. There seems to be also a correlation between the length of the aerial and the dimensions of the insects recorded. Little antennas (1 meter) allow reception of smaller insects, with longer antennas (i.e. big Marconi aerial) the phenomena disappear. By the way, this is what we call "Nature Radio"... click HERE to hear an example (150 kb). Many other signals were present, sferics, high-pitched tones and so on. Here follows the analysis of the tracks. This time the tracks were not been resampled at 44,1 kHz but left at 48 kHz, the files have been saved on CD as wave data files, so it's possible to postprocess signals up to 24 kHz. First track [Track01] was a test. The AC input impedance of XSP is about 15 Mohm, the bikeloop magnetic antenna has a low impedance, this means that input is (more or less) shorted to ground. This means also a great noise. Regardless of this hypothesis some statics have been received showing the high sensitivity of the device. [Track01] did not show strange or unusual signals. Second track [Track02] pointed out the high sensitivity of XSP. High level man-made noise is also present. 1 - 23400 Hz - DHO30, Navy Ramsloh (D) RTTY 200 baud. 2 - 23000 Hz - Russian BETA Time signal marker, followed at the and by carriers on 22900 and 22500 Hz, probably correlated. 3 - 21750 Hz - HWU, Navy Le Blanc (F) RTTY 200baud. 4 - 20300 Hz - ICV, Tavolara Island, Sardinia (I). 5 - 19600 Hz - GBZ, Criggons (GB). 6 - 18200 Hz - VTX3, Indian Navy Traffic Station, CW callsign correctly identified. 7 - 16000 Hz - GBR, Rugby (GB). 8 - 14881 Hz - Alpha, Ex-USSR radionavigation system. 9 - 12650 Hz - Alpha, Ex-USSR radionavigation system. 10 - 11905 Hz - Alpha, Ex-USSR radionavigation system. [Track03] 16400 Hz - JXN, Noviken, Norway, signal disappears after 14'17''. [Track03] 18100 Hz - UQFE, Ex-USSR, several RTTY transmissions. [Track04] 20500 Hz - Received carrier from 22'42'' to 27'26''. Frequency appears to be used from 3SA/3SB, Datong, China Naval Base. Now, let's have a look below 10 kHz. No interesting signals have been received, all lines are man-made noise, the only noticeable thing is a fluctuation of the 900 Hz tone, origin and explaination are unknown. There are many other strange signals, fluctuations of 50 Hz main hum produces harmonics up to 800 Hz and appears like some kind of AFSK transmission, but they are not. These fluctuations could be caused by asymmetric and/or unbalanced loads on three-phase distribution lines. Currently we do not have any filter for 50 Hz. It has been designed but not built yet. We did not receive any activity on Schumann frequencies, nor on 76 and 82 Hz band. Probably the input impedance of XSP is still too low to record them with short aerials. We are working on a second front-end circuit with (even) a higher impedance. With this second circuit we will also be able to connect our Bikeloop magnetic antenna. Construction of the second front-end and lab/on-field comparison with the first prototype, expecially in the ELF/ULF range. Construction/assembly of circuitry for differential input. Test with magnetic and/or electrical antenna. Construction and optimization of 50 Hz active filter. Construction and optimization of power circuits, expecially concerning dual feeding and cabling. The XSP Receiver is a portable all-purpose receiver. This means of course that it needs electrical power. 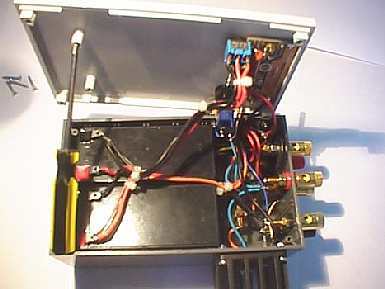 In the next future, receiver will need a dual voltage, so I decided to assembly this simple box, which can be also used for a moltitude of other applications, such as amateur radio, CD player and so on. and not too expensive, as usual. As main power source I used two sealed Pb-gel batteries, 12V, 1.2 Ah. I preferred Pb-gel instead of Ni-MH or Ni-Cd because these kind of battery can be easily recharged with power supply in my shack without complicated circuits. I did not even consider Li-ion batteries, for the high cost of cells. depending on the nature of load connected. Bargraph it's a voltmeter (0.8 V each segment). It has been calibrated to be completely off when batteries are discharged (18V). Full scale voltage is about 25V. Useful to keep batteries in health. 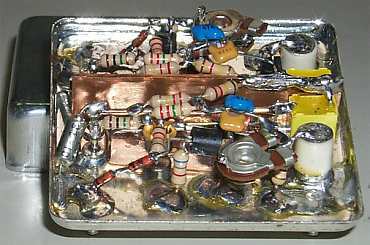 Two big heat dissipater have been provided for the BD-711/712 transistor, clearly visible. As many things, this schematic has been drawn one evening during a dinner on a paper napkin. The picture is a scanned bitmap of the original (still in my pocket), so it is not perfect. The circuit is very simple, S1 is a double switch (A and B), I is the main single Switch, LD is a LED who lights on when batteries are connected in series. Rec is a female-RCA plug used to recharge batteries. (V) is the voltmeter. The Op-Amp ua741 is referenced to Vcc/2. The two transistors are connected to form an "active voltage divider". In this configuration transistors works to mantain the "virtual GND" voltage equal to the voltage applied on to the non-inverting input of the Op-Amp. This will cause the "virtual GND" terminal to be always at Vcc/2. Circuit has been tested with a continuous 2A load on a single leg (the most critical situation) without any problem or overheating. This is a pic or the the internal wiring of XSP-PP. The size of Teko enclosure match perfectly with the size of the two batteries. Total weight is less than 1 kg. This is our idea of "Portable power pack", performances and circuitry could be enhanced, of course, but until now it's a cheap and reliable solution. Stay tuned for further info about "XSP" project...! Many thanks to Renato Romero, Michele D'Amico and Scott Fusare for all informations about "electrostatics flies".